Considering the impact Buddy Holly has had on popular music, it is hard to believe that his recording career didn’t even last two years. At the tender age of 23, and with only 3 official studio albums recorded, Charles Hardin Holley died tragically in an aeroplane crash that also took the lives of Ritchie Valens, and The Big Bopper. In the song American Pie, Don McLean famously described the incident as ‘The day the music died’. During conversations about music, it’s easy to nod our heads and agree on the importance of Buddy Holly’s music, but does it live up to all its hype? Is it truly ‘great’, or something we know we’re supposed to enjoy, but truthfully don’t? It’s actually surprisingly hard to track down Holly’s studio albums amidst the hundreds of compilations that are available. The only way I could get them was to purchase all three as a single CD ‘collection’ (a case in point of how short the albums are), which came to a cheap-as-ASDA-smart-price-oven-chips £2.33 per record. Amazon.co.uk: Katy Perry Unplugged: £9.99; All 3 of Buddy Holly’s studio albums: £6.99. What IS the world coming to? Being a fan of the song ‘Everyday’, and using it as I might a mutual friend to introduce me to strangers I might not like, I opted to listen to Holly’s eponymous offering first. I need not have worried: it’s fantastic. Any fan of music, whatever their tastes, should listen to this. As one might expect from the era, the arrangements are basic, most of the time using the classic rock ‘n’ roll combo of drums, bass, rhythm guitar and vocals, but the recordings are crisp and clear, betraying the fact that they were made over 50 years ago. In the middle of the mix lies Holly’s voice. Not as distinctive as Elvis, or as jaw-dropping as Little Richard, Holly’s vocal strength lies in its versatility. Whether it’s ripping the bejesus out of Ready Teddy and Rave On, or delicately caressing the melodies of Everyday and Words of Love, he really does sound fantastic. And what about his delightful hiccoughs and glottal stops (‘Mailman, bring me no more bl-u-u-u-u-u – hiccough-o-o-wo-wo-hiccough-ues’)? Buddy Holly as a whole is enjoyable from beginning to end, but it’s during the middle that things start to get really interesting. The pace slows, the drums and rhythm guitar get less frantic, and the melodies become more complex. Everyday in particular, with its beautiful Celeste solo, is 2 minutes 6 seconds of music paradise. In contrast to the brilliant music inside, the album’s front cover is a candidate for worst ever (Holly has the typical look of the myopic man who’s just removed his glasses for the photograph), and is possibly only beaten by the next album That’ll Be The Day. Still, I’d swap awe-inspiring album art for awe-inspiring music any day (as would the i-Tunes generation, I’m sure), and this is only a tiny criticism. At under 25 minutes long, the album came and went as quickly as Pepperoni slices at a Pizza Hut Buffet, and, I have to say, it was a truly great musical experience. Goliaths of music, Green Day and Eminem, with their last albums clocking in at 77.06 and 69.15 mins respectively, should take heed: less is more. My advice to anyone is to go and spend the £6.99, and when Eastenders is next on, turn the TV off, put the CD player on, and in the time it takes for someone to spread misery around Albert Square, you will have listened to something truly outstanding. 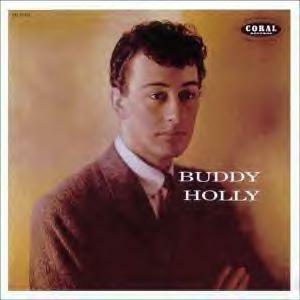 Living in 1955, Buddy Holly is ‘hip’ and ‘current’ to me! It’s amazing to think that such a brilliant and unique voice could ever come out of such an odd looking man. Brilliant!